And finally there's the reports of alleged sexual attacks/suspicious approaches by a man - possibly more than one - targeting lone females of all ages. He appears to frequent Dart stations and lonely areas in a local and beautiful south Dublin village, rich with scenic wooded spaces. Apparently there is a suspect - if you believe what you read in the papers - but he hasn't been arrested yet. This community is genuinely in fear, especially for their teenage and young adult daughters. Few go out walking alone and in particular do not do so late at night, either from the last bus/Dart or from the local pub. It's horrible. All of it. And I abhor those carrying out these awful acts on our fellow citizens. And I strongly object to being practically held prisoner in my own village. However we must bear in mind that these events are relatively rare, in the grand scheme of things. So it is important to keep perspective. It's also important not to panic. Too much. You can't believe everything you read in newspapers, or on Facebook, after all. According to this news report BT Ireland was contracted in 2009 to run Ireland's 999 emergency public service, before outsourcing it to Conduit Global. There was another incident this week when another 999 call went unanswered. In both cases someone else did get through but that's not good enough. What if there was an emergency elsewhere at the same time? We need a Government that takes the safety of this country's citizens seriously and resources it's police service appropriately. We must question politicians, currently strutting the election trail, on the re-opening of Garda Stations that were recently closed down and on how effectively our emergency call services are being run. And on how appropriate it is to outsource such an important public service. Seriously..... the mind boggles. It's important to be get advice, information and re-assurance from An Garda Siochana, but it's also important to let them do their job. Undoubtedly there are operational reasons for what may appear to be their silence. However pushing them on can lead to patrol saturation, and to revealing alleged undercover operations that may only serve to push the perpetrator back under the rock from which he crawled. Or on to another area free to attack other women. There is now official advice on what to do if you think you are being stopped by a fake unmarked Garda car, with flashing blue light. You must be fairly sure it's fake though as you MUST stop for an official unmarked car. I have also today established with Garda HQ that, unlike in the UK, Gardai DO NOT have to be in uniform, or wear any Garda insignia vest/clothing etc, to stop you in an unmarked vehicle. But they do have to show you identification on request ... even before quoting the acts under which you are being stopped. If they don't then you are within your rights to drive away. As always 'there's an App for that' - PanicGuard.This App: 'track[s] you in real time from the moment PanicGuard is activated, even though an alert has not yet been raised. We do this so, that we can backtrack your movements and possibly find CCTV footage on your route for further evidence, if need be.' Might be worth investigating. Links to two important personal safety advice pieces were brought to my attention and both are worth reading and passing on to others. *Don't wear your hair in a pony tail. * Always tell someone your planned route. The second one is a MUST READ. It's based on questions allegedly put to men who previously abused women, as to what they looked for in a victim. It's a very interesting read and the advice is probably something we should all keep in mind. It'll certainly make you more aware of your surroundings when getting into your car in a dark, lonely car park. There are too many important pieces of information to highlight any in particular. Just read it. Seriously.... now! my car before driving off. local Garda Station phone number in my contacts. As I've said these recent events are a relatively rare occurrence. Ireland remains as safe a place to live and visit as any other country. We should let these events serve to remind us of the care we should always take with our own, our children, teenagers and our young adults personal safety. 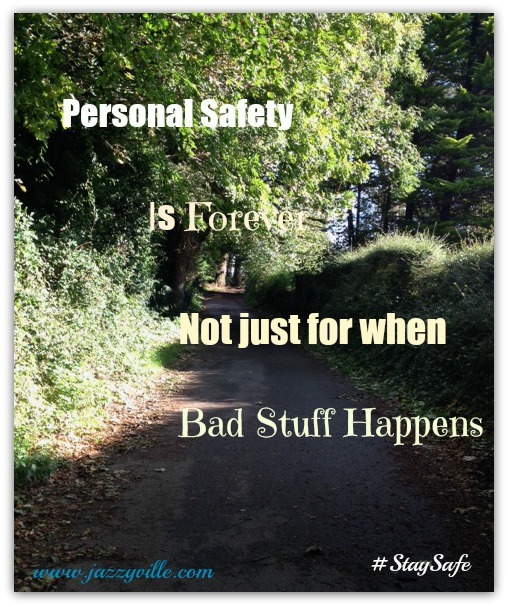 After all concerns about Personal Safety are not only for when 'bad stuff happens'. They are for life. Please, be vigilant out there and stay safe. All good advice but what is the significance of not wearing a pony tail? Is it because a pony tail is easy to grab hold of? @Midlife Singlemum: Yes, precisely. It's discussed in more details in the links I included and it makes both lists! @Looking for Blue Sky: That's it. Unfortunately for the moment here it's best not to go out alone. But, if walking home alone from the last Dart or bus is the only way I can attend an event I WILL be doing it. With due precautions and vigilance of course. I refuse to let this guy make me stay home.